Home Sweet Home: Would You Go For A Black Wall? During my travels, I've seen a lot of earth tone colors being used on the walls of hotels, shops and restaurants that I've visited and I personally find it classy. It is a good break from the the usual trendy colors being used at homes. Earth tone wall perfectly adds drama to a room. I think dark chocolate, dark gray or deep brown is perfect but for a black wall? Hmmm.....let me think again. The black wall being shown on the above photo was able to give justice to the overall impact of the room. I think the choice of colors for the wall decors and furniture plays a significant role. 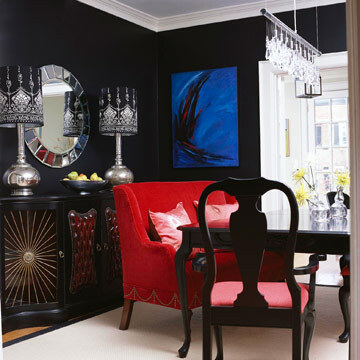 Black is a depressing color but if you are able to combine it with the right colors, then this can really add personality to the room. Why not if my house would look as gorgeous as this! It's good to be creative with colors and the web is a good reference point too! I agree with Ms. Farida. I would go for the black wall too, it looks elegant e. But I agree with you, the right choice of furniture compliment with the black wall. Our pedia's clinic naman has red walls. Favorite daw nya kasi ang red.